In 2005-2007, Anthony Barnett, Glenn Tootle, Steve Gray, and colleagues at the University of Wyoming conducted a research effort to collect new chronologies in the upper Green River basin and generate streamflow reconstructions for the mainstem Green River and its headwater tributaries. Their work resulted in eight reconstructions of annual (water-year) streamflow, which are all archived in TreeFlow, including the Pine Creek above Fremont Lake reconstuction. Figure 1. 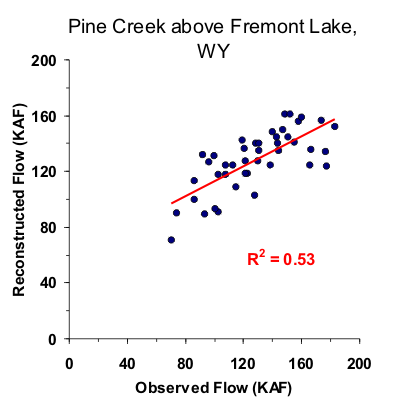 Scatter plot of observed and reconstructed Pine Creek annual flow, 1955-1997. Figure 2. Observed (black) and reconstructed (blue) annual Pine Creek annual flow, 1955-1997. The observed mean is shown by the dashed line. Figure 3. Reconstructed annual flow for Pine Creek (1615-1999) is shown in blue. Observed flow is shown in gray and the long-term reconstructed mean is shown by the dashed line. Figure 4. The 10-year running mean (plotted on final year) of reconstructed Pine Creek flow, 1615-1999. Reconstructed values are shown in blue and observed values are shown in gray. The long-term reconstructed mean is shown by the dashed line.